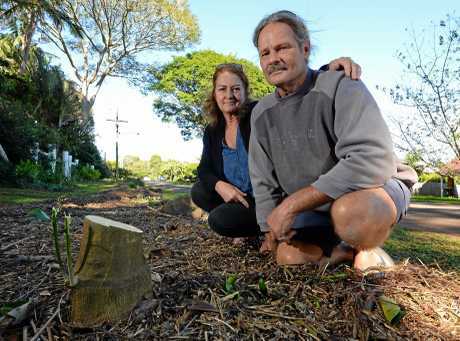 TEARS welled in Zoe Kamarinos' eyes as she surveyed the tree stumps along Clithero Avenue, where her favourite kumquat tree stood until about 9am on Wednesday morning. The 12-year-old was sick from school today and had enjoyed fresh oranges for breakfast, courtesy of her neighbours. "It's really sad," she said. 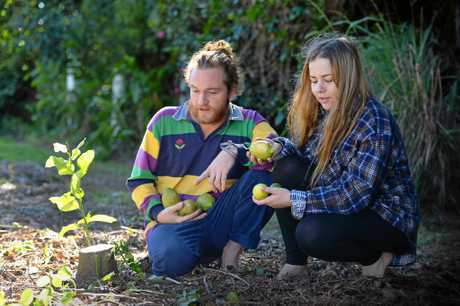 Buderim's Urban Food Street project was established in 2010 by residents Caroline Kemp and Duncan McNaught, and quickly caught on with people growing fresh produce on their front verges to share. 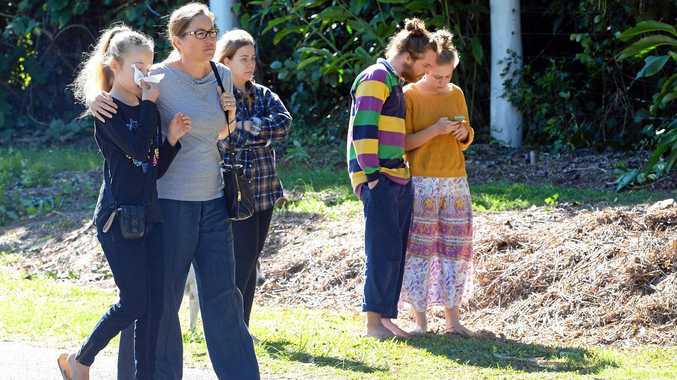 Earlier this year, the Sunshine Coast Council told property owners they would need to apply for permits and public liability insurance, as the veggie gardens presented a hazard to pedestrians. A number of residents chose to pay up for their insurance, a few removed or relocated their gardens and a handful more did neither, prompting council to remove the offending plants. 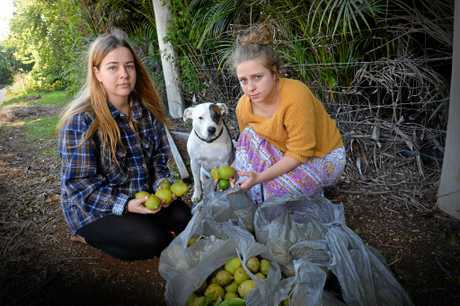 Paul Harns, who rents one of the properties which had its front yard cleared, said it didn't make sense to him why council had decided to remove the fruit-laden trees without alerting them. "Council say they're sustainable but then do this when people try doing something sustainable," he said. "I feel really sorry for (the co-founders). "They've put a lot of their money and time into it." Those who gathered in front of the stumps and mulch piles said there was no warning before the felling began, and lamented that they could not have picked any of the fruit before the trees were cut down. 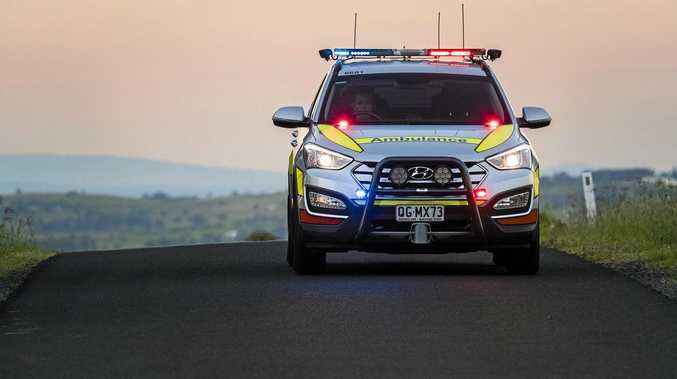 A resident who contacted the Sunshine Coast Daily and asked to remain anonymous said the street's inhabitants were very unhappy and labelled the action as "ridiculous". "They could have waited until the trees were complete," she said..
"Council just wasted all that food." Elly Nielsen managed to salvage six shopping bags of lemons by climbing one of the trees in an effort to stop its removal and handed fruit out to people who came by. Most residents said they were simply in shock but some wondered aloud what would happen next. Councillor Ted Hungerford said there were still four property owners who were yet to comply with council directions. "If they choose the same path, this will unfortunately be the end result for them as well," he said. "We're hoping they come in to work with us. "All I can say is what's happened today is disappointing." Disappointing was also the word used by Wendy and Ian Michel, who live opposite from where the citrus trees once stood. "We've had tourists here from up north, down south, overseas, what will they be saying now?," said Ian. "A lot of people are going to be asking questions but it's hard to say what will happen now." Mr Harns said he liked the idea of re-planting the now freshly-mulched nature strip. "To me, it seems like it's got to be a catalyst for something," he said. Fellow Urban Food Street member Lisa Edward said the clearing was "senseless". "It caused more joy than harm, and now that joy has been destroyed." A solicitor estimated public liability insurance to cost between $100-$400 per property owner.